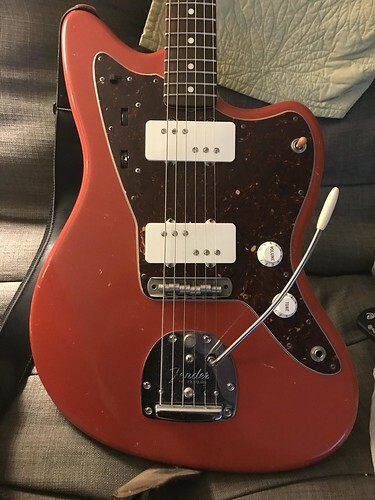 I got this sweet Jazzmaster in trade and had a couple minor things I am working on for it. Here is how it looked before I got to work on it. 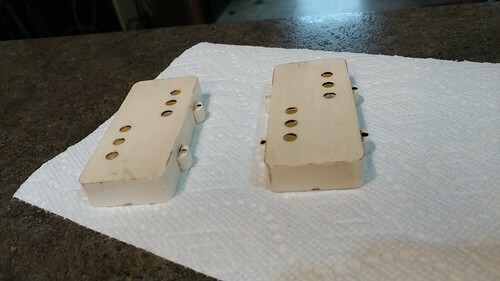 I plan on aging the knobs and pickup covers. 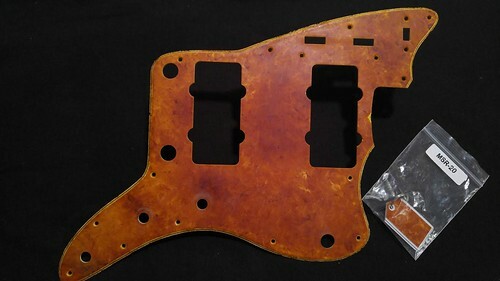 I also want to add a Spitfire faded orange pickguard to it. Covers and guard are off. Added a little dark walnut stain to show off the scratches and edges a bit and make it look a little more beat up. 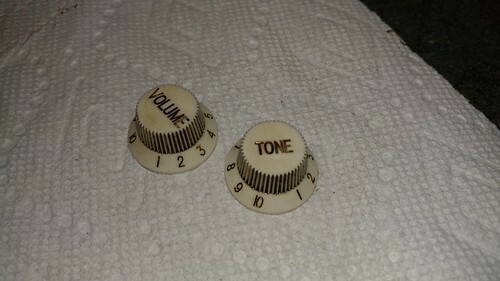 The knobs are soaking in coffee over night. 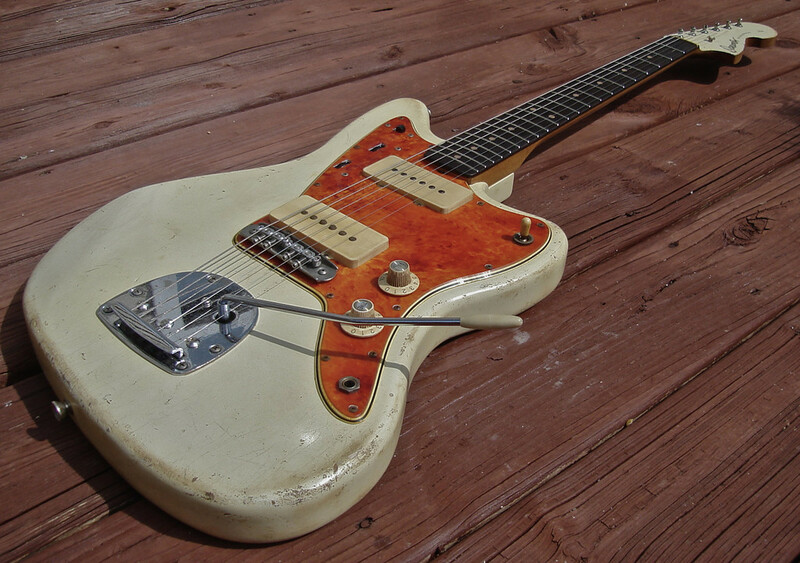 Mate, do Belinda Jazzmaster. 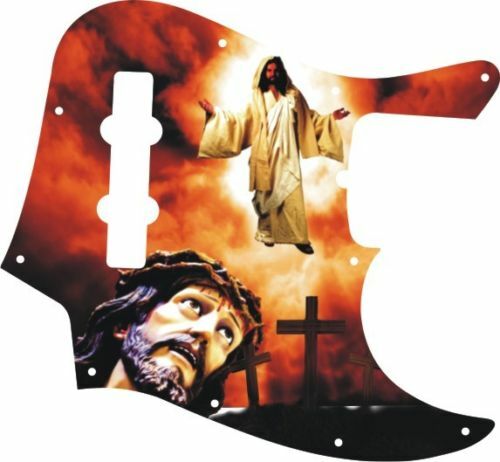 I'm too drunk to link it but is my dream guitar. She has a few. This would look line one of hers sun aged. 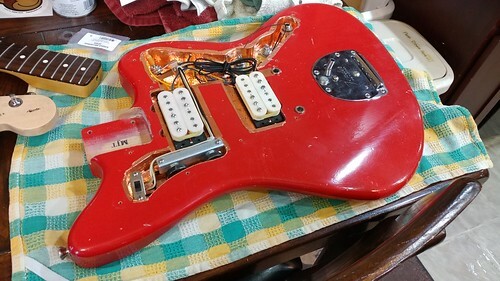 Those wide range Jazzmaster pickups look like big dominoes. They're kinda cool looking, kinda wrong looking too. Are they Novak's? Nice jazzy man. I too was wondering what kind of pickups are those? Pretty cool looking. I had a red Jazzmaster once upon a time too, except I think it was candy apple red with a matching headstock. Not vintage, reissue back in like 2006-7ish? That thing was killer. I still regret trading in that guitar. They are Novak WRHB for Jazzmasters. 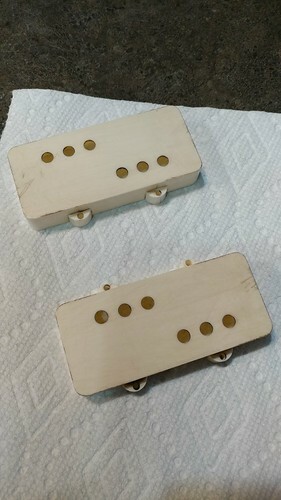 Got the knobs stained to give them a dirty look. Looks good, kinda like the one I built a little while ago, but aged nicely. New pickup screws came, neck screws, and pots. I got the pots replaced and tested it out. Things sounded ok except the roller tone pot was backwards and the switch was backwards. (Up did the lower controls and down did the upper ones.) I sorted that out and grounded the bridge. Just needs the pickguard! Sorry if this is a noob question. 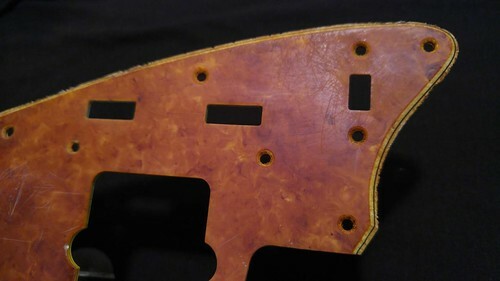 But what's that copper looking sheet metal doing at the bottom of the cavities of your guitar? 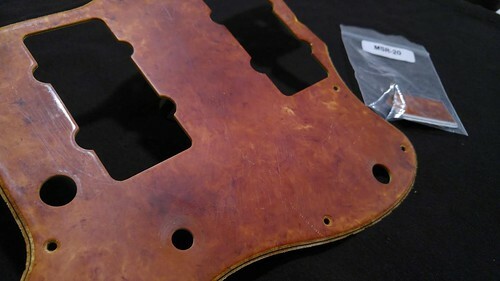 And how did you learn to do repair work on guitars? Just curious because someday I'd like to become more familiar with doing my own repair and such. All that aside, can't wait to see how it comes out and looks! As far as learning to work on guitars, it has been trial and error. I did do a jewelry class in college so I had a little experience welding small things and using solder, but really it was just reading forums like this, looking at diagrams, and trying my best. 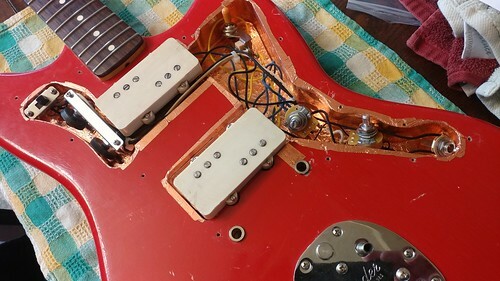 Normally wiring for a Jazzmaster looks like this diagram below. You can see where each wire goes, so you just have to solder the wires where it says to. Other than that it is just making sure the metal parts are grounded correctly. That is also easy to test. If you touch a metal part of the guitar with it plugged in and there is noise that happens, then it is likely that part isn't grounded. If the quiet hum gets quieter, the part is grounded correctly. 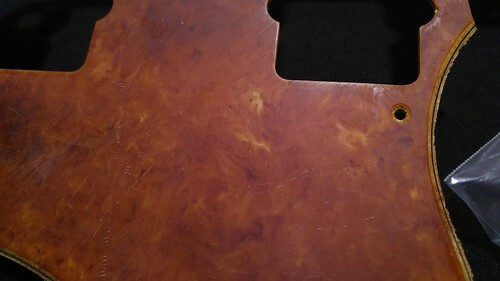 I fount a couple things on this guitar that was not grounded right. When you modify wiring you can either ask people on forums to help and sometimes they will, or try things out and see if it works. 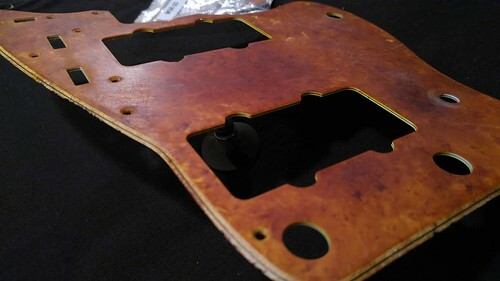 My Spitfire pickguard is done and heading my way! Super excited. It turned out so sweet! Those guards look great! Are they expensive? About $230. Individually made to your specs color wise. I love it. They aren't everyone's cup of tea. I really love how they look and the options you can get. Plus each one is unique and not able to be exactly duplicated. I tend to use them on my most special guitars.